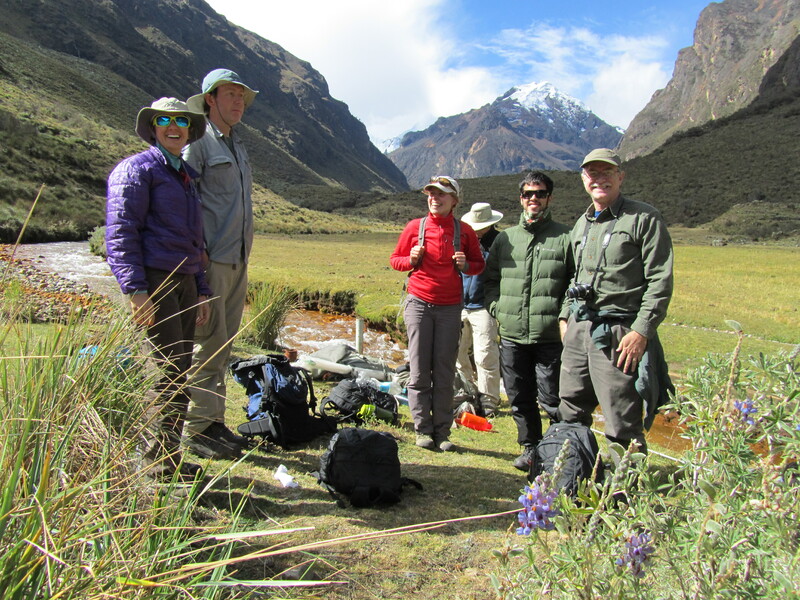 The Transdisciplinary Andean Research Network (TARN) was co-founded and is co-directed by Mark Carey and a group of researchers working in Peru: Michel Baraer, Jeff Bury, Adam French, Bryan Mark, Jeff McKenzie, and Kenneth Young. To understand the intersecting issues of climate change, glacier retreat, hydrological resources, water use, societal adaptation, and glacial hazards in the Andes, focusing in particular on the Cordillera Blanca and Santa River watershed. The interdisciplinary group has teamed up to bring fresh, innovative perspectives to these processes—generating conclusions that come from rigorous interactions and stimulating cross-disciplinary collaboration. Members of TARN had a strong presence at the Foro Internacional de Glaciares (International Glacier Forum) in Huaraz, Peru, July 1-4, 2013. Every member played a key role by giving lectures, exhibiting posters, and participating in various planning and organizational meetings directed toward the future of glacier-related research, policies, and climate change adaptation measures. The Foro has posted PDFs of presentations on its website. Part of the “TARN Trip Peru 2013” was also to teach and mentor students from the various institutions involved. Most of the researchers brought undergraduate students, and there was also a strong showing of Master’s and Ph.D. students with the TARN team, too. The lead PIs of the project believe strongly in bringing students into the field, exposing them to all the various types of research conducted, and teaching them how to do hydrological and glaciological research alongside historical archive research and social science interviews in human geography. As part of the group in Peru for three weeks, students also saw how TARN works across disciplines—the challenges as well as successes and breakthroughs. You can read students’ blog posts from the TARN Trip Peru 2013.
from the Center for Undergraduate Research and Engagement (CURE). Spring 2019: Hayley Brazier, a PhD candidate in the History Department, has been awarded a 2019 Wayne Morse Graduate Research Fellowship from the Wayne Morse Center for Law and Politics, as well as winning a Graduate Research Support Fellowship from the Oregon Humanities Center. Spring 2019: Holly Moulton, a PhD student in the Environmental Studies Program, wins 2 fellowships for dissertation research in Peru: a Graduate Research Award from the Center for the Study of Women in Society and a Summer Research Grant from the Center for Latino/a & Latin American Studies (CLLAS). Fall 2018: Zac Provant, a PhD student in the Environmental Studies Program, and Michael Madden, an MA student in the Environmental Studies Program, join the Glacier Lab. Fall 2018: Mark Carey wins the King Albert Mountain Award, presented in Pontresina, Switzerland, for his life-long contributions to mountain communities and environments. Spring 2018: Becca Marshall joins the Peace Corps in Gambia starting later this year. Spring 2018: Lab members win several fellowships, grants, and awards: UO Dissertation Research Fellowship (Olivia Molden); Tinker Field Research Grant provided through the Center for Latino/a and Latin American Studies (Holly Moulton); Environmental Studies Interdisciplinary Research Seed Grant for a joint ice-related field course with Dave Sutherland's Oceans and Ice Lab (Holly Moulton, Hayley Brazier, and Mark Carey). Spring 2018: Hayley Brazier will be teaching a summer course on "Oceans and Society" in Woods Hole, MA for the Sea Education Association. Her course will be for advanced high school students who are beginning their training as oceanographers. Spring 2018: Alina Motschmann, a PhD student in Christian Huggel's Glaciology and Geomorphodynamics group in the Department of Geography at the University of Zurich, is visiting the Glacier Lab this term, to work on a collaborative project in the Peruvian Andes. Winter 2018: Becca Marshall wins a prestigious University of Oregon Humanities Undergraduate Research Fellowship for her research on wild mushroom harvesting in Oregon. Fall 2017: Hayley Brazier receives a scholarship from the Digital Humanities Summer Institute at the University of Victoria to attend the "Text Mapping as Modelling" course in Victoria in June 2018. Fall 2017: Olivia Molden and Katie Meehan publish their new article, "Sociotechnical imaginaries of urban development: social movements around 'traditional' water infrastructure in the Kathmandu Valley," in Urban Geography. Fall 2017: Mark Carey appears on a podcast of The Alpinist called "Mountaineering and Climate Change." Fall 2017: Hayley Brazier receives fellowship to attend the ENHANCE School in Public Environmental Humanities in Stockholm, Sweden, sponsored by the KTH Royal Institute of Technology. Summer 2017:Andrea Willingham successfully defends her M.A. thesis in Environmental Studies. Spring 2017: M Jackson and Sean Munger successfully defend their Ph.D. dissertations in Geography and History, respectively. Josie Kinney successfully defends her B.A. Honors College thesis in Environmental Studies and Spanish. Spring 2017: Augustine Beard becomes an Udall Undergraduate Scholar and wins a University of Oregon Library’s Undergraduate Research Award for his paper "Enemy in the Forests: Narratives and Fire in the Pacific Northwest." Winter 2017: M Jackson presents our research in a TEDx talk at Middlebury College on "We Need More Stories of Ice." Winter 2017: Augustine Beard is awarded an Oregon Heritage Fellowship for his research on drought and land use among the Norther Paiute. Fall 2016: Olivia Molden receives a Fulbright-Hays Doctoral Dissertation Research Abroad grant to study water security in Nepal. Summer 2016: Several new research assistants are working over the summer on glacier conservation, indigenous peoples and climate change in the Andes, glacier hazards, climate and health, and web design for the Glaciers and Society website. Summer 2016: Sandro Antonello accepts new position as McKenzie Postdoctoral Fellow in the School of Historical and Philosophical Studies, University of Melbourne, Australia. Spring term 2016: Asghar Kahn (Karakoram International University) joins the Glacier Lab, visiting from Pakistan.